How does this stability arise out of aggregation? The answer lies in what has been called 'pseudo-interference' (Free et al., 1977). With mutual interference, as predator density increases, predators spend an increasing amount of time interacting with one another, and their attack rate therefore declines. With pseudo-interference, attack rate also declines with parasitoid density, but as a result of an increasing fraction of encounters being wasted on hosts that have already been attacked. The crucial point is that 'aggregation of risk' amongst hosts tends to increase the amount of pseudo-interference. At low parasitoid densities, a parasitoid is unlikely to have its attack rate reduced as a result of aggregation. But at higher parasitoid densities, parasitoids in aggregations (where most of them are) will increasingly be faced with host patches in which most or all of the hosts have already been parasitized. As para-sitoid density increases, therefore, their effective attack rate (and hence their subsequent birth rate) declines rapidly - a directly density-dependent effect. This dampens both the natural oscillations in parasitoid density, and their impact on host mortality. To summarize, aggregation of risk stabilizes host-parasitoid interactions by strengthening direct (not delayed) density dependencies that already exist (Taylor, 1993). The stabilizing powers of this spatial phenomenon, aggregation of risk, therefore arise not from any spatial density dependencies, but from its translation into direct, temporal density dependence. 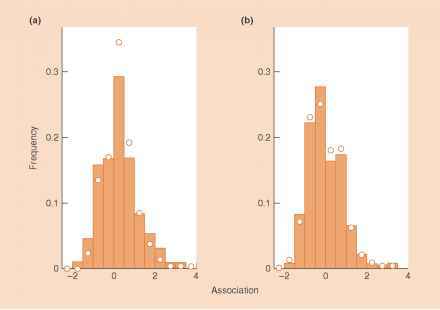 But how does aggregation of risk relate to the aggregative responses of parasitoids? And do aggregative responses and aggregation of risk necessarily lead to enhanced stability? We can address these questions by examining Figure 10.14, bearing in mind from Section 9.6 that aggregated predators do not necessarily spend most time foraging in patches of high host density (spatial density dependence); foraging time can also be negatively correlated with host density (inverse density dependence) or independent of host density. Start with Figure 10.14a. The distribution of parasitoids over host patches follows a perfect, straight line density-dependent relationship. But, since the host: parasitoid ratio is therefore the same in each host patch, the risk is likely to be the same in each host patch, too. Thus, positive spatial density dependence does not necessarily lead to aggregation of risk and does not necessarily enhance stability. On the other hand, with a directly density-dependent relationship that accelerates (Figure 10.14b), there does appear to be aggregation of risk, and this might well enhance stability (Hassell & May, 1973); but it turns out that whether or not it does so depends on the parasitoids' functional response (Ives, 1992a). With a type 1 response, assumed by most analyses, stability is enhanced. But with a more realistic type 2 response, initial increases in density-dependent aggregation from zero aggregation actually decrease aggregation of risk and are destabilizing. Only high levels of density-dependent aggregation are stabilizing. Moreover, it is clear from Figures 10.14c and d that there can be considerable aggregation of risk with either inverse spatial density dependence or no spatial density dependence of any sort - and these would not be counteracted by a type 2 functional response. In partial answer to our two questions above, therefore, aggregative responses that are spatially density dependent are actually least likely to lead to aggregation of risk, and therefore least likely to enhance stability. 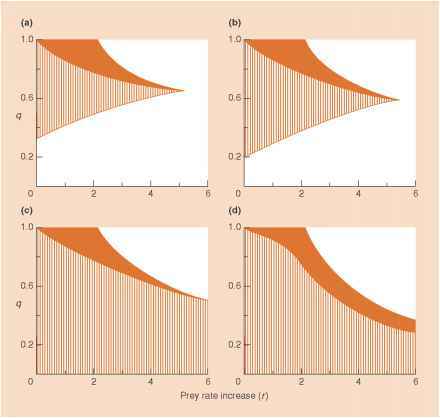 Figure 10.14 The aggregative responses of parasitoids and the aggregation of risk. 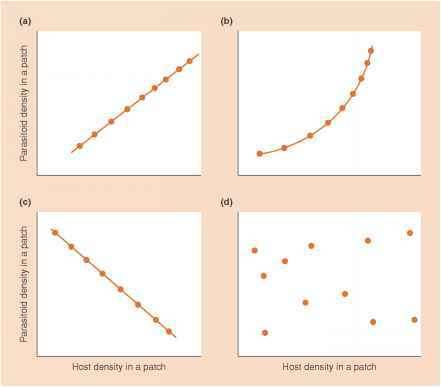 (a) Parasitoids aggregate in high host-density patches, but the parasitoid : host ratio is the same in all patches (a perfect straight-line relationship), and hence the risk to hosts is apparently the same in all patches. (b) Parasitoid aggregation to high host-density patches now accelerates with increasing host density, and hosts in high-density patches are thus apparently at greater risk of parasitization: there is aggregation of risk. (c) With perfect inverse density dependence (i.e. parasitoid aggregation in low host-density patches) the hosts in the low-density patches are apparently at a much greater risk of parasitization: again there is aggregation of risk. (d) Even with no aggregative response (density independence) the hosts in some patches are apparently at a greater risk of parasitization (are subject to a higher parasitoid : host ratio) than others: here too there is aggregation of risk. called the former the 'host density dependent' (HDD) component, and the latter the 'host density independent' (HDI) component, and have described methods by which, in real data sets like Figure 9.20, the aggregation of risk can be split between them. Interestingly, in an analysis of 65 data sets, representing 26 different host-parasitoid combinations (Pacala & Hassell, 1991), 18 appeared to have sufficient aggregation of risk to stabilize their interactions, but for 14 of these 18 cases, it was HDI variation that contributed most to the total, further weakening any imagined link between spatial density dependence and stability.